It’s tough to miss Addison Circle Park; just look for the four-story, 410,000-pound steel structure marking the entrance. 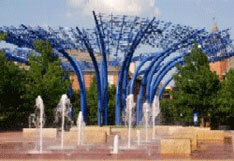 Called Blueprints, the enormous blue sculpture represents Addison’s history and future, and it also serves as the gateway to Addison Circle Park. The 10-acre park hosts plenty of special events through the City of Addison, as well as concerts in the summer and plays in the fall. Every May, the park hosts Taste Addison, a festival during which you can sample food from restaurants around the city while taking in live music, cooking demonstrations, and more. Kaboom Town is Addison’s annual Independence Day celebration that culminates in a half-hour fireworks show. There’s also Addison’s take on Oktoberfest, with polka music, folk dancing, and, of course, plenty of bratwurst and beer. The park covers more than 370,000 square feet with fountains for the kids to run through, walking trails, a pergola, three separate performance venues, and a pavilion that can be rented out for special events. Even when there’s nothing going on, Addison Circle Park is a great place to explore.